To make the pound cake: In a mixer set with the paddle attachment, beat the butter over medium speed until soft and creamy, about 5 minutes. Add the granulated sugar and continue to beat until well mixed and creamy, another 2 to 3 minutes. Beat in the egg yolks, add the lime zest and continue to beat until fully incorporated, another 2 minutes or so. Reduce the speed to low, and gently add the all-purpose flour, salt and baking powder. Continue to beat for another couple minutes. The batter should be completely homogeneous and feel a bit dense and heavy. Transfer the batter to a large mixing bowl. Rinse the bowl of the mixer well and change the paddle attachment to the whisk attachment. Beat the egg whites on medium-high speed, until they hold stiff peaks, about 4 to 5 minutes. Slowly, incorporate a bit of the fluffed-up egg whites into the heavy batter. Repeat with the rest of the whites, folding them gently but persistently, until the batter is completely incorporated and seems lighter and fluffier. Don’t over mix, or you will remove the puff effect form the beaten egg whites! Preheat the oven to 350°F. Butter the sides and bottom of a loaf pan and lightly coat with all-purpose flour. Shake out any extra flour. Pour the batter into the prepared mold and bake in the oven about 50 minutes, or until the pound cake is golden brown on top, seems beautifully fluffy and a toothpick comes out clean. Remove from the oven. Let cool for at least 10 minutes. To make the lime syrup: Combine the 1/2 cup lime juice with the granulated sugar in a small saucepan and heat over medium heat for a couple minutes, just until sugar has diluted. Run the tip of a knife around the edges of the pound cake. Place an inverted platter or board on top of the loaf pan. Invert to release the pound cake and immediately invert another platter on top of the upside down pound cake, flip over to have straight side up. With a toothpick, poke holes all over its surface, going as deep as the toothpick will go. Pour the entire lime syrup evenly over the pound cake. Let it sit for 10 minutes. To make the lime glaze: In a small mixing bowl, combine the 2 tablespoons lime juice with the vanilla and confectioners’ sugar until thoroughly mixed. With a tablespoon, add one tablespoon at a time over the pound cake and rub it gently with the back of the spoon to spread it over the top. Let some of the extra glaze slide down the sides, as it will give it a pretty glazed look. Let the glaze dry for at least 10 minutes. Enjoy! Cover the pound cake, so it will remain moist, if there is any left over. this cake awakens the senses so good! Can you replace the lime with lemon, Pati? will the lime syrup make the cake soggy? Oh it makes it nice and moist, not soggy. Enjoy, Dee! My boyfriend loves watching cooking shows now we do it together. Your recipes brings people together,like familia. He gets excited when he hears and sees fish tacos being made!! I have tried a lot of your recipes,always a winner. I have learned how to use peppers cuz he likes it spicy! Living on the gulf coast of south Mississippi seafood is a huge market for recipes. Thank you for all your shows,they are informative and fun. Can’t wait for your new season. Aww thank you so much Sonya! Say hi to your boyfriend for me. Going to try this recipe and the Baja fish tacos. My Nana loved pound cake,so I do this in her honor. What a wonderful way to honor your nana, Sonya. Can I freeze the Triple Lime Pound Cake? I wouldn’t recommend to freeze it…but you could refrigerate it for up to 10 days. Also, it lasts for a week covered at room temperature. I’m your fan in your TV program “Pati Mexican Table”. Your description is very clear and I like to hear your Mexican accents. You are friendly too and I like to be your friend. Hola, Pati!! I was so happy to see this episode this morning because I wanted a really good cake to make for my husband on Valentine’s day, and tryout beautiful lime pound cake is it!! By the way, I loved your show with JuJu helping you make the Dulce de leche cheesecake!! I can tell he is a really sweet (and funny!) boy! All three of your boys are fine young men!! I love your show — much more than Rick Bayless’s show because your recipes are just as legitimately Mexican as his, but much more practical!! Your sisters are all beautiful like you, too. You were THE person who got me to actually use chiles instead of always using dry spices and I love how they roast and rehydrate and flavor everything so beautifully!! Many thanks for three great seasons. I hope you have many more to share! !!! !LOVE YOUR SHOW. I LOVE YOUR KITCHEN IT LOOKS LIKE A REAL”HOME” KITCHEN NOT A STUDIO.MAKES YOUR RECIPIES LOOK EVEN MORE APPETIZING.ACTUALLY BRINGS ME TEARS OF JOY REMEMBERING MY MOMS COOKING AND “DICHOS” YOU KNOW HOW EVERY MOM HAD SEVERAL. THEYRE EASY RECEPIES THAT ARE MADE WITH EVERY DAY INGREDIENTS WE HAVE IN OUR PANTRY.I CANT EVEN MENTION ONE FVORITE ONE BECA– USE THEY ALL ARE REALLY! !.BUT THE ONE WITH THE MOYETES AND SOPA DE LETRAS WAS ONE OF MY TOP FAVORITES. PLEASE CONTINUE WITH YOUR SHOW,MUCH SUCCESS AND MUCHAS BENDICIONES TO YOU AND YOUR FAMILY.AND THE BEST RECEPIES ARE THE ONES YOU MAKE WHEN YOUR IN A PINCH AND THINK YOU HAVE NOTHING IN THE PANTRY OR REFRI CA– USE YOUR CREATIVITY COMES OUT!!!!!! Hi Gina, Thank you so much for your message! So happy you found my show, and your mom sounds like a lovely woman & cook!! Pati, I just watched your cooking show for the first time with my father. Where can I find all recipes: Tortilla Soup, Lime Pound cake and the other item you made? Saw this recipe a week ago and made it for New Years. What a wonderful recipe, it turned out perfectly and is without a doubt the best cake I’ve made! Love the show………. What size loaf pan are you using? I cannot wait to make this it looks so good. Love your show and cannot wait for more. Thank you for sharing all of your recipes and knowledge with us. Thank you for your message, Sallie! I share with you all with much, much joy. I use a 9 x 5 loaf pan. Hi!! I’ve made this several times – I’ve used limes and I’ve used lemons and once I used combo of both so I could use up what I had on hand. :)!! I make it for a fund-raiser at work at least once a month and it is a best seller!!! It is just fabulous – thank you for the recipe. I love watching your show and I love your accent!! Hi Jill, So glad you like the recipe; thank you for making it to share at your fundraiser!! would love to make this recipe for my Mexican niece-in-law and was also wondering if it could be made with lemon instead of the lime for another person I know. Hi Rebecca! Yes, you may try it with lemon instead of lime. Let me know what you think! Hola Pati! I love love love your show! I love you too! I can’t wait to try your lime pound cake recipe! I wish your show was on all the time! Lucy, thank you for watching! Watched your show last night and knew that I wanted to make your Triple lime pound cake as soon as your finished. I ended up making it as soon as the show ended. Was so anxious while it was cooking, had a little sliver as soon as it came out and it was delicious. With the lime sauce over it made it even better. Thanks so much for the recipe. It will be my go to from now on! I am so glad it will be now part of your own home cooking, Elizabeth! Your show is my favorite! I can’t wait to try this recipe. Thank you for sharing. Thank you, Carleen! I hope you try it!! Your such Fun..Fun to watch and Listen too.your a “Hoot” I wish you were my neighbor…I would be at your home everyday. In your kitchen.making Me Mexican Dishes all the time..I Love !!!!! !…your Show…!!!!!!!!!!!!! Can I tell you how addicting your show is!! !… See I am of half Mexican descent. My mother never taught me the Beauty of Mexican cooking that you bring to the show. It has been a wondrous experience learning & watching your show. Love it Love it!!! Beautiful show. Thank you so, so much Emelyn! I’m happy you found the show!! Thank you so much for placing your amazing recipes here on your site! They are so easy to search and find, and unlike other cooking shows, you don’t require your viewers to “sign up” or get a membership etc… Thank you, thank you! Love your show, and I am baking the pound cake now. It smells wonderful! I have not come into the 21st century yet. I’m probably the last person in earth who doesn’t have a stand mixer. So, I’m wondering if a hand mixer will work? If so, about how long will it take to whip the eggwhites using a handmixer with regular beaters? Also, can I use a tube pan? I am very excited about trying this cake.I want to make it for my mother’s 90th…yes 90th birthday! Of course you can use a hand mixer. It depends on what kind of hand mixer you have but I am guessing it will not be more than 4 or five minutes… Yes. You can make it in a tube pan too! Happy 90th birthday to your mom! 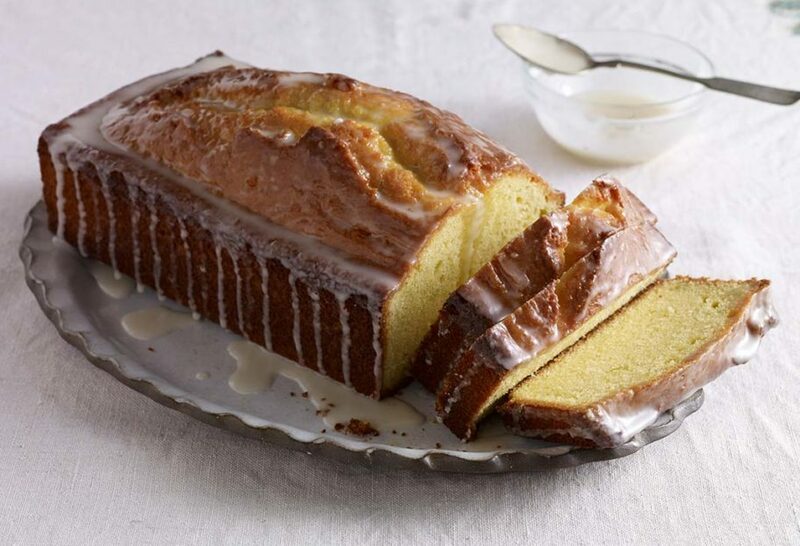 I love pound cake and cannot wait to try this recipe for Triple Lime Pound Cake. What is the chopped fruit on top of the cake seen in the picture ? Pati, an amazing recipe, thank you! Made this today but with lemons since I did not have any limes. (will have to make it again soon but with the limes. Next up is your tortilla soup this weekend! I find it is easier to get juice out of lemons. Can I use lemons instead for this recipe? Love your show I will be making the soup and cake for the game. Can this cake be made ahead of time and frozen. If not can it be stored in the refrigerator? For how long? I wouldn’t recommend to freeze it. You could refrigerate it for up to 10 days and it would be fine. But it also stays lovely for a week covered at room temperature. Yes you can Adriana!!! It will be just as good and maybe even prettier! Either will be fine, just check for when it is done, with a toothpick, the thinner the batter (the bigger the pan) the less minutes it will be.